NASA has announced successful tests of a small fission reactor capable of producing about 10 kilowatts of power, and hopes the technology will prove suitable for use on the Moon or Mars. The space agency’s developed the reactor because crewed missions will need lots more electricity than can be generated by either the Sun or the radioisotope thermoelectric generators that power the likes of the Voyager probes, New Horizons and the Curiosity rover. Future probes will also be able to do more if they have more power to play with. 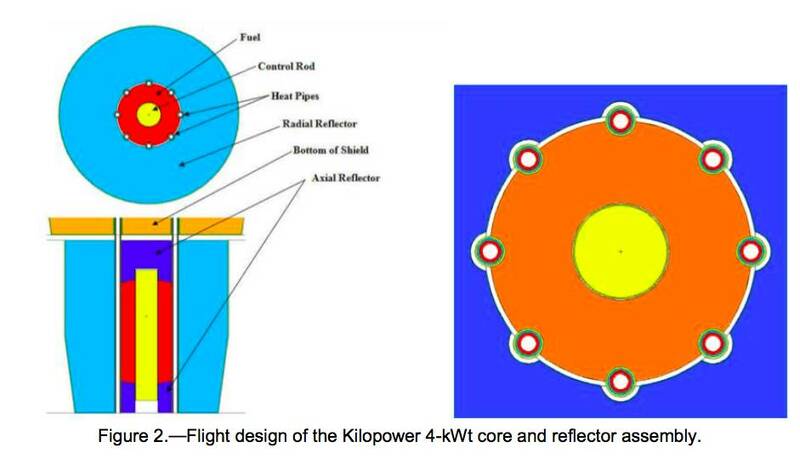 Enter “Kilopower”, a fission reactor with the potential for output of 10 kilowatts. As described in a 2015 paper (PDF) the device has a small, hollow, Uranium 235 core. The central hole can be occupied by a single control rod. When on, the device creates heat that passes up through “sodium heat pipes” until it reaches Stirling Engines that turn it into electricity. The reactor is not yet flight-ready and will need lots of testing to get it there, not least because people tend to be nervous about large chunks of fissile material on rockets. There’s also the small matter of vacuum testing.